A common to very common, yearlong resident throughout much of the state, except in deserts and higher elevations (Small 1994). Frequents scrub habitats, especially with oaks; chaparral, coastal scrub, hardwood, hardwood-conifer, valley foothill riparian, pinyon-juniper, and urban. Occurs irregularly in fall and winter in desert areas (Garrett and Dunn 1981). Some upslope movement after breeding in foothills (McCaskie et al. 1979). The island scrub-jay (A. insularis), previously a sub-species of western scrub-jay and resident on Santa Cruz Island (Pitelka 1951, Garrett and Dunn 1981), was recently elevated to specific level (AOU 1995). Feeding: Omnivorous; mostly eats acorns, nuts, seeds, fruits, insects, and other invertebrates. Also eats small vertebrates, bird eggs and young. Gleans and picks food from ground, foliage, bark and wood. Hammers nuts open. Often caches nuts and other food in soil (Bent 1946). Cover: Generally prefers trees and shrubs in arid woodlands and shrublands; also frequents riparian woodlands. Common in residential areas. Reproduction: Nest is a cup of twigs and grasses lined with rootlets and other plant fibers; built by both sexes (Harrison 1978). Nest usually placed in dense foliage in a tree or shrub 0.9 to 9 m (3-30 ft) high, often near water (Airola 1980). Water: Williams and Koenig (1980) reported regular drinking visits to a spring in oak woodland in coastal California. Drinking water probably essential. Pattern: Prefers open woodlands and shrublands, especially with oaks. Seasonal Movements/Migration: Yearlong, resident in the state. May move upslope after breeding in lower elevations of mountains. Irregularly found in desert areas and along the Colorado River in fall and winter (Garrett and Dunn 1981). D. A. Airola (unpublished data) suggests regular movements across the Sierra Nevada in Plumas Co.
Home Range: Same size as territory (Airola 1980). Erickson (1937) reported density of 1 pair per 1.6 to 4 ha (4-10 ac.). Territory: Verbeek (1973) reported territory "about" 3 ha (7.5 ac) in coastal California, and defended yearlong. Hardy (1961) reported a single territory/home range of 2.1 ha (5.3 ac) in New Mexico. Reproduction: Breeds from early March to mid-August. Monogamous; Lays 2-6 eggs, usually 2-3; clutch smaller in arid areas. Incubation 15-18 days, by female only. Male feeds female during incubation. Altricial young tended by both parents (Harrison 1978). Young leave nest at 18-23 days (Bent 1946, Ehrlich et al. 1988). Niche: Occasionally preyed upon by hawks, small mammals, and other corvids. Closely associated with oaks and acorns. Steals acorn woodpecker caches. American Ornithologists Union. 1995. Fortieth supplement to the American Ornithologists' Union Check-list of North American Birds. Auk 112:819-830. Airola, D. A., ed. 1980. California wildlife habitat relationships program: Northeast Interior Zone. Vol III. Birds. U.S. Dep. Agric., For. Serv., Lassen Natl. For., Susanville. 590pp. Bent, A. C. 1946. Life histories of North American jays, crows, and titmice. U.S. Natl. Mus. Bull. 191. 495pp. Erickson, M. M. 1937. A jay shoot in California. Condor 39:111-115. Garrett, K., and J. Dunn. 1981. Birds of southern California. Los Angeles Audubon Soc. 408pp. Hardy, J. W. 1961. Studies in behavior and phylogeny of certain new world jays (Garrulinae). Univ. Kans. Sci. Bull. 42:13-149. Pitelka, F. A. 1951. Speciation and ecological distribution in American jays in the Genus Aphelocoma. Univ. Calif. Publ. Zool. 50:195-464. Small, A. 1994. California birds: their status and distribution. Ibis Publishing Co., Vista, CA. Verbeek, N. A. M. 1973. The exploitation system of the yellow-billed magpie. Univ. Calif. Publ. Zool. 99:1-58. Williams, P. L., and W. D. Koenig. 1980. Water dependence of birds in a temperate oak woodland. Auk 97:339-350. Also known as the California Jay, this species of scrub jay native to western North America, from southern Washington, United States southeast to west Texas and south to central Mexico. The Santa Cruz or Island Scrub Jay (Aphelocoma insularis) found only on Santa Cruz Island is a closely related species. 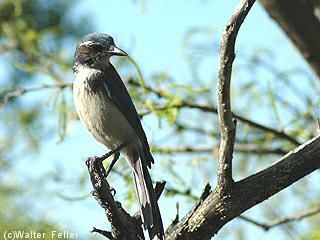 The Western, Santa Cruz, and Florida Scrub Jay were once considered sub-species of Scrub Jay. The Western Scrub Jay is nonmigratory. This species is 27-31 cm (11.5 in) long including its long tail, and weighs about 80 g. Coastal Pacific birds tend to be brighter in coloration than those of the interior, but all are patterned in blue, white, and gray. Western Scrub Jays feed on small animals, eggs and young of other birds, insects, and (particularly in winter) nuts and berries. True to their name, Western Scrub Jays inhabit areas of low scrub, preferring pinyon-juniper forests, oak woods, or sometimes mesquite bosques. They are known for hoarding and burying brightly colored objects.